Kaspersky Lab, a global cybersecurity company, met with Malaysian Prime Minster Tun Dr Mahathir. A mutually beneficial meeting, the private company gained a better understanding of challenges unique to Malaysia and the Government’s plan for the future. 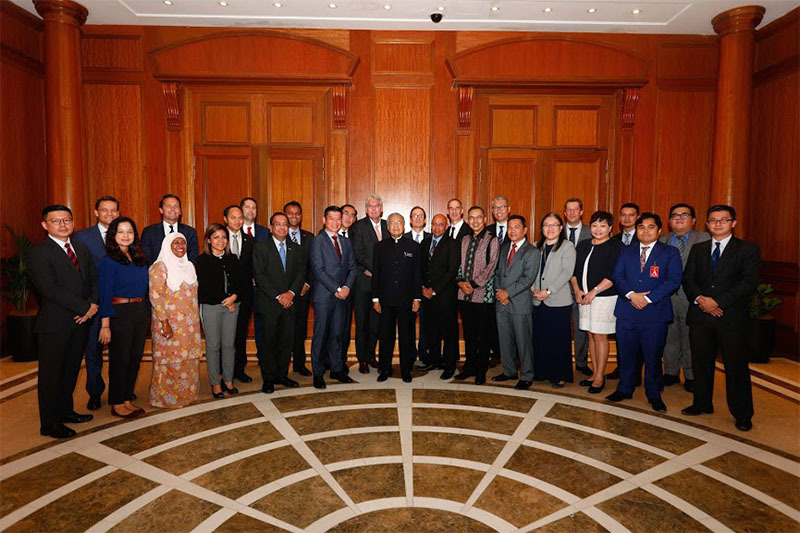 Kaspersky Lab was part of the European-ASEAN Business Alliance’s (EABA) Mission to Malaysia held between October 22 to 23, 2018 at Putrajaya. Kaspersky Lab is a member of EABA. The Europe-ASEAN Business Alliance (EABA) is a member-driven alliance of leading European multinational companies with significant interests in the ASEAN region, with the aim to serve as a platform for dialogue with national governments and regional organisations. The EABA provides a forum for discussion of issues of relevance to European business in the region. A meeting like this is timely and appropriate. Cybersecurity services from Malaysia and two other major ASEAN countries will contribute to 75% of market share by 2025. This is according to Malaysia’s Communications and Multimedia Minister, Gobind Singh Deo. Furthermore, Tun Dr Mahathir clinching the post as Prime Minister has led to changes in administration and business climate. Mahathir’s party ousted the long standing incumbent UMNO in a watershed General Election in May 2018. Major political decisions, particularly a promise to restore democratic and clean institutions, have rattled government administration at a phenomenal scale. These decisions are not stand alone. Impact will be felt on the business environment. Among the Prime Minister’s entourage was Minister of Finance, YB Lim Guan Eng, Deputy Minister of International Trade and Industry, YB Ong Kian Ming, and others. Participating in the business mission, the global cybersecurity company had the opportunity to improve its understanding of major policies to be rolled out by the newly installed Pakatan Harapan Government. The meeting also provided the company a chance to learn the Government’s plans. “The meeting allowed us to learn about the new policies being implemented by the new government, their approach towards cybersecurity and it also provided us an opportunity for us to share our best practices with them. These discussions should be on-going, such as national digital ID that was introduced by Minister of Communications and Multimedia YB Gobind Singh Deo in early October,” said Stephan Neumeier, Managing Director, APAC, Kaspersky Lab. At the meeting, Neumeier shared his assessment of the next level of cybersecurity threat and what key questions business leaders should be asking about cyber security. Although no formal presentations were done, the meeting was a useful avenue to briefly exchange opinions on Malaysia’s economic development. Malaysia is a land of opportunities for cybersecurity companies. “A study published by Global Cybersecurity Index in 2017 shows that Malaysia ranked third in terms of its commitment to cybersecurity. Malaysia has always been a key market for Kaspersky Lab, as the policies are in support for ICT development in the country,” Neumeier added. Malaysia is committed to becoming a leading country within ASEAN to provide robust resources for advanced cybersecurity analytics and forensic resources. A national cybersecurity preparedness will be enhanced to secure digital economy growth. In Malaysia’s strategy toolbox are plans to encourage STEM graduates to take on cybersecurity as a career. Along the same vein, more effort is being deployed to developing artificial intelligence capability. The cybersecurity company’s hand in this transformation is building Malaysia’s capacity development through university partnerships. Currently, work is being done with University Malaya and University Malaya Sarawak (UNIMAS). The cybersecurity is in collaboration with CyberSecurity Malaysia. Kaspersky Lab’s Southeast Asia regional HQ is in Petaling Jaya, Selangor, Malaysia.